If we look around in the world as impartial observers, we shall see that most people live their lives closed into a hypnotic dream. From dawn to dusk, from birth to death we rush to achieve our goals, pursuing our desires, and suffer from not having a free moment for ourselves, we are overburdened, and live in constant stress. This hypnotic dream is the consequence of the nature of the mind. 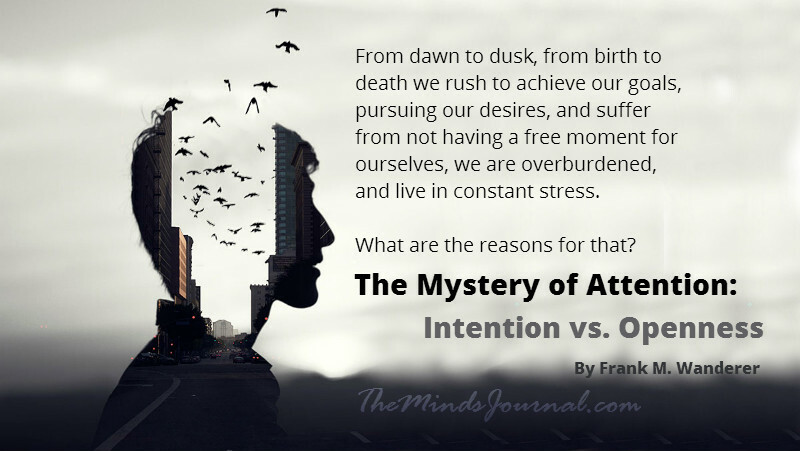 Once the mind has focused its attention on something, intention automatically appears in us. The intention further narrows down our attention to a specific idea and the desires and emotions connected to it. From that moment on, our life is not under our control, but under the control of the intention. Apart from the things which are the subject of our intention, everything else is left in the background inside us. Our consciousness is obscured and narrowed down, and the tension of the intention focusing on one specific goal takes control over our actions. With the intention comes hope that some day in the future our intention will come true, we achieve our goal and we harvest the fruit of our efforts. In the majority of the cases, though, the hope remains futile, because there are so many things we wish to achieve in life, our energies and time are limited, so the majority of our goals will be inaccessible for us. Even if we reach one of our goals, very soon a thousand new ones vie for our attention. This hypnotic work of our intentions locks us up in the prison of our desires and objectives and makes it impossible for us to return to the Miracle, to the original state of our existence: openness. Openness is the state of pure attention, which is not narrowed down by any kind of a desire. This consciousness is not focusing on anything, it does not aspire to get anywhere, it plainly and simply IS here and now. In the state of openness the fire of desire is not burning in us, our glance is not blocked and obscured by various opinions and thoughts, our hopes are now in ashes, because after a great deal of suffering, we have finally realized that our hopes are the sources of all our suffering. We then discover that the Miracle, the openness we have been searching for, has been there with us right from the beginnings, we just locked it up behind the bars of our intentions.